All this week, various celebrations around the country will honor our nation's teachers. NCSS is proud to serve teachers and support promising practices in the social studies classroom. We would not be here without you! Thank you for inspiring our learners every day to learn about the world around them, and how they can be engaged and informed citizens in our world! Every teacher practices a special craft that is a life’s work and passion. We all can name a teacher who inspired us personally and professionally. That teacher may have become a mentor beyond the classroom. That teacher may have inspired a calling to pursue teaching as a profession. I am curious to know what inspired that teacher to dedicate a career to nurturing our next generation of learners. 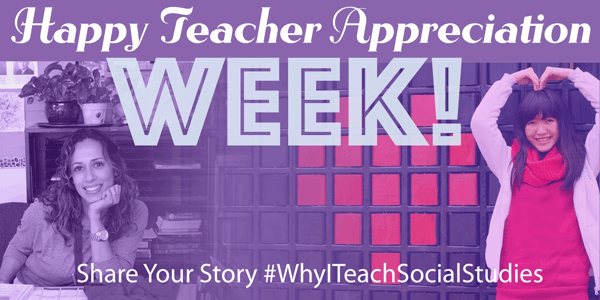 For Teacher Appreciation Week, NCSS would love to learn what inspired you to become a social studies teacher. We invite you to share a moment with us @NCSSNetwork or on Facebook. Use the hashtag #WhyITeachSocialStudies to share your moment and start the conversation with educators worldwide. I'll be sure to highlight many shared moments in an upcoming blog to keep our Teacher Appreciation Week celebration going strong! I knew I wanted to become a social studies teacher since the fifth grade. My teacher, Mr. Busher, encouraged my new interest in the U.S. Presidents by letting me set up a corner table in the classroom to profile a different President’s biography each week. I remember learning a lot about U.S. history, the states, and the branches of government that year. I thought teaching would be the most exciting thing to do from that year on – and there was no question I wanted to teach social studies! I feel very fortunate to have had the chance to start my career in education as a middle school social studies teacher. While I figure out how to condense that moment into 140 characters, please share your moment of inspiration--and enjoy the week!